Some of you probably noticed there wasn’t a recipe post last week. There’s not one today, either. I want to start to focus this blog a bit more narrowly, and spend more time writing e-books and fiction. I’ll probably still post recipes as I find some that I want to share, but there will no longer be one every Wednesday. I want to make this blog more helpful to my readers. Most feedback I receive has been on my posts about personality psychology and Christianity. With that in mind, the Christian-themed posts will continue every Saturday, and my immediate goal is to finish and release the INFJ e-book I announced a few months ago (it’s mostly finished, but you still have time to contribute if you like. Click the link for more information). I’ve also been working for a couple years on a high school English curriculum for homeschoolers. My younger brother is working through it now (it’s great — I get someone to test my curriculum, and I’m being paid in books for teaching his English class). My goal is to make it flexible enough that parents can tailor the assignments for different students’ learning styles and personalities. If all goes well, the freshman course will be out in a year or so. 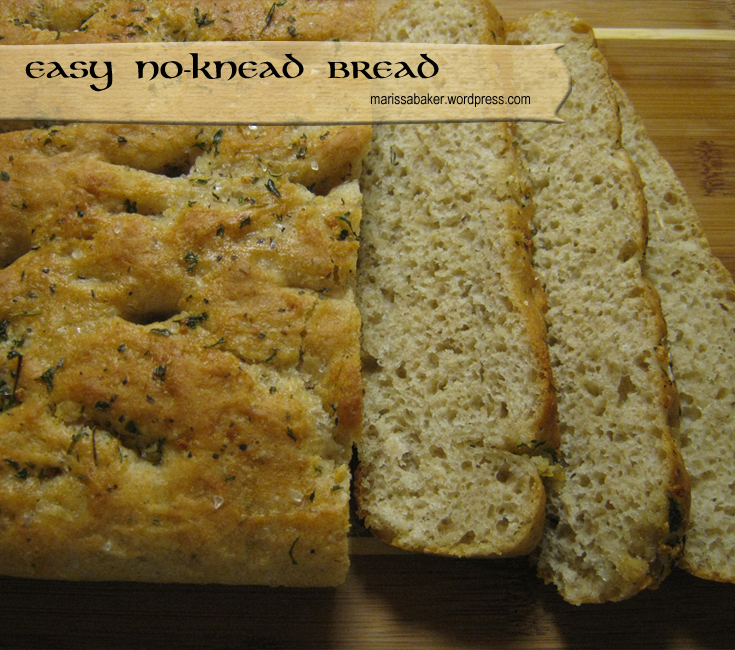 My new favorite bread recipe comes from alexandracooks.com. Be sure to click over there and visit her recipe, since she has lots of tips for making this turn out just-right, as well as several variations that I haven’t tried working with yet. 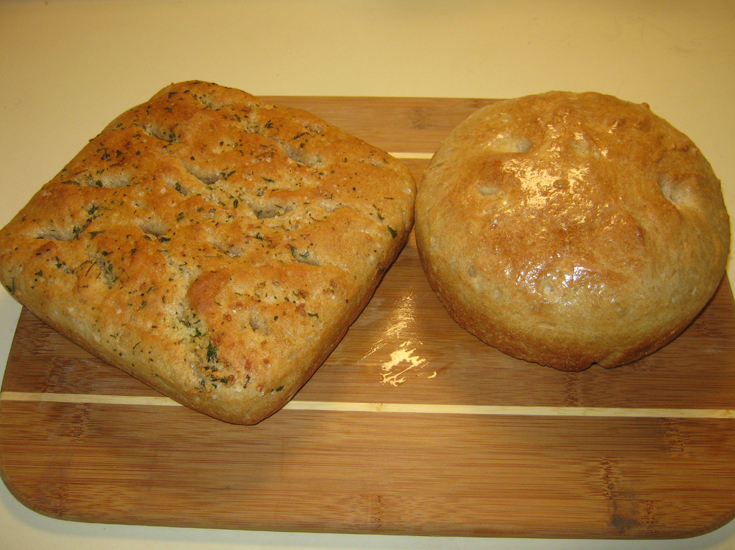 What I’m posting today focuses on making one peasant loaf and one faux focaccia loaf. This bread is incredible easy to make, but you do have to plan ahead. I need about three hours between the time you start the bread to the time when you can eat it. Announcement: I’m planning some changes to this blog to focus on providing more useful resources for my readers. My posts on type psychology have been the ones people consistently comment on as being the most helpful, so I want to focus on that while continuing to write my Christian articles and introducing homeschooling resources for teaching high-school English. With all these changes, I’m most likely going to be phasing-out these weekly recipe posts or moving them to a different blogging platform (unless you all REALLY want me to keep them, in which case they’ll probably be less frequent). Dissolve the sugar into the water in a small mixing bowl or glass measuring cup. 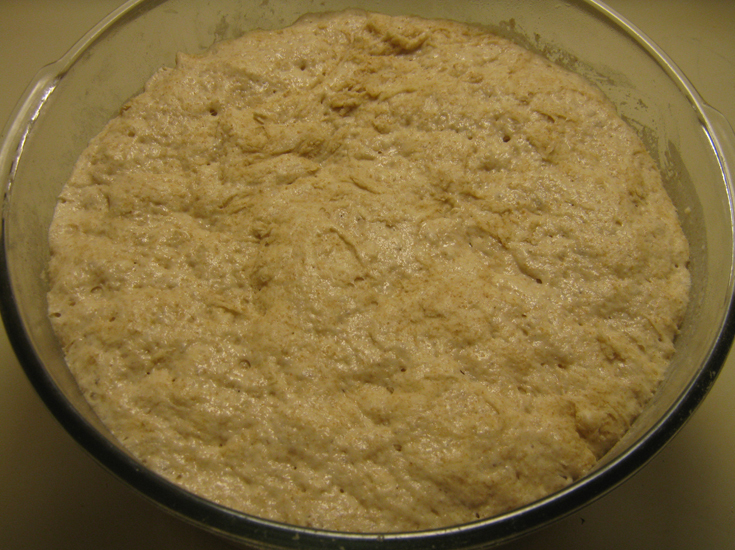 Sprinkle the yeast over top, then let it stand for about 10 to 15 minutes until the mixture is foamy. Meanwhile, in a large bowl, whisk together the flour and salt. Once the yeast mixture is foamy, stir it up. 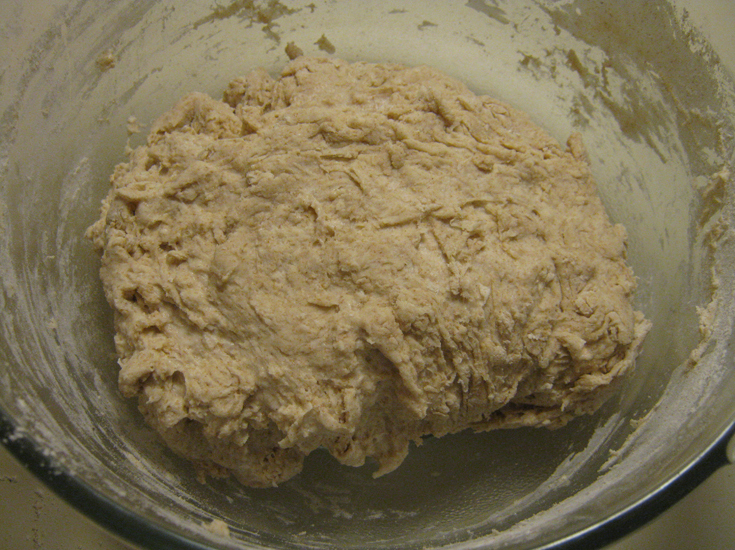 Mix the yeast mixture into the flour until it forms a soft dough. Cover the bowl with a tea towel run under hot water and rung out so it is slightly damp. Set it aside in a warm spot to rise for about one-and-a-half hours. Grease one oven-safe bowl or a medium casserole dish and one 9-inch by 9-inch baking dish. 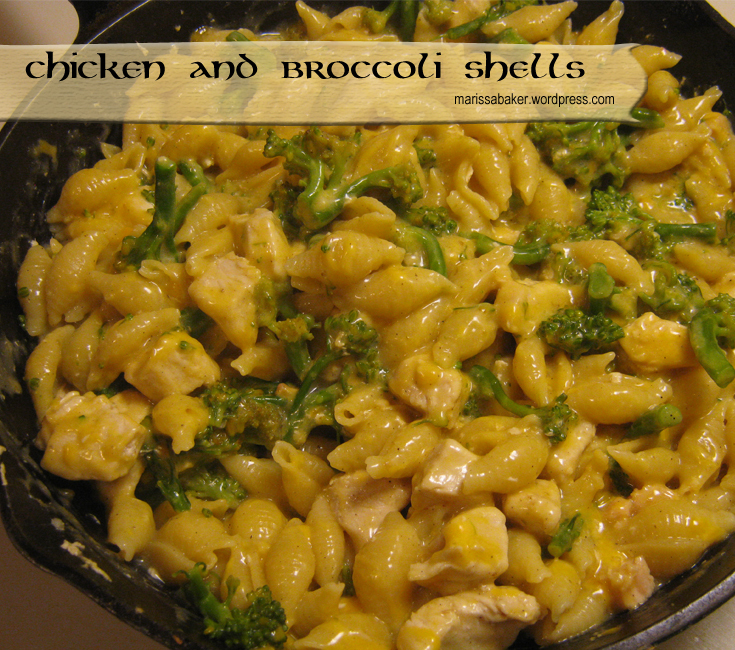 Use 1/2 tablespoon of butter for each. 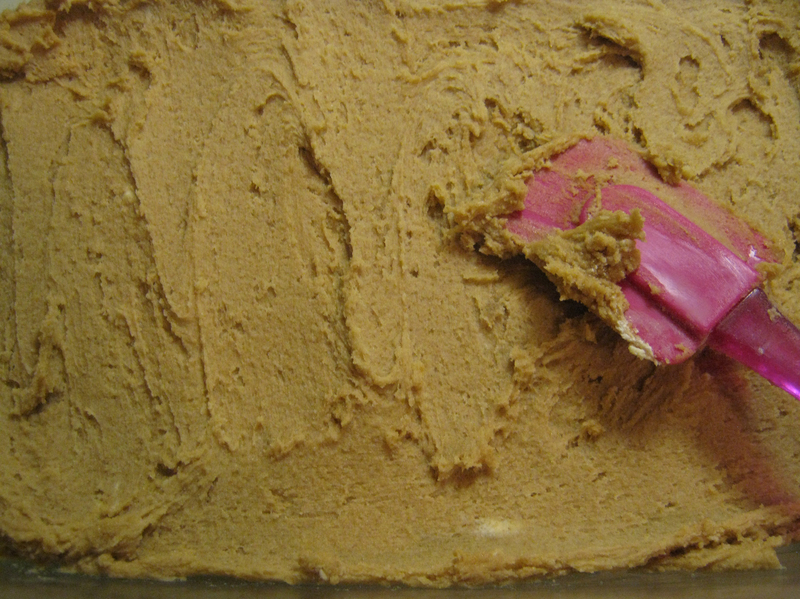 Using two forks, punch down the dough and scrape it from the sides of the bowl, turning the dough over on itself. Using the two forks, pull the dough apart into the equal portions and then scoop one into each baking dish. 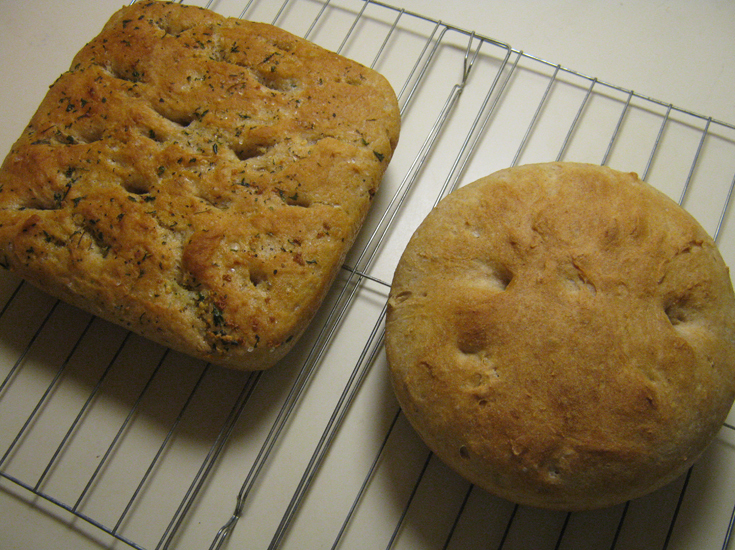 The peasant loaf, the one in the bowl or casserole dish, is now done. For the faux focaccia, mix 1 Tablespoon olive oil, 1/8 teaspoon Italian seasoning, 1/4 teaspoon parsley, and 1 clove diced garlic. Spread the dough out with your fingers to fit the shape of the pan, then dip your fingers in the olive oil mixture and press the top of the dough to make dimples in the surface. Spread the remainder of the olive oil mixture on top of the bread, and then sprinkle the top with coarse sea salt. Preheat the oven to 425ºF. Let the dough rise for about 20 to 30 minutes, then bake for 12 minutes. Reduce the heat to 375ºF and bake for another 10 to 15 minutes. Remove from the oven and turn the loaves onto cooling racks. Brush the top of the peasant loaf with butter. Let the loaves cool for about 10 minutes before cutting. 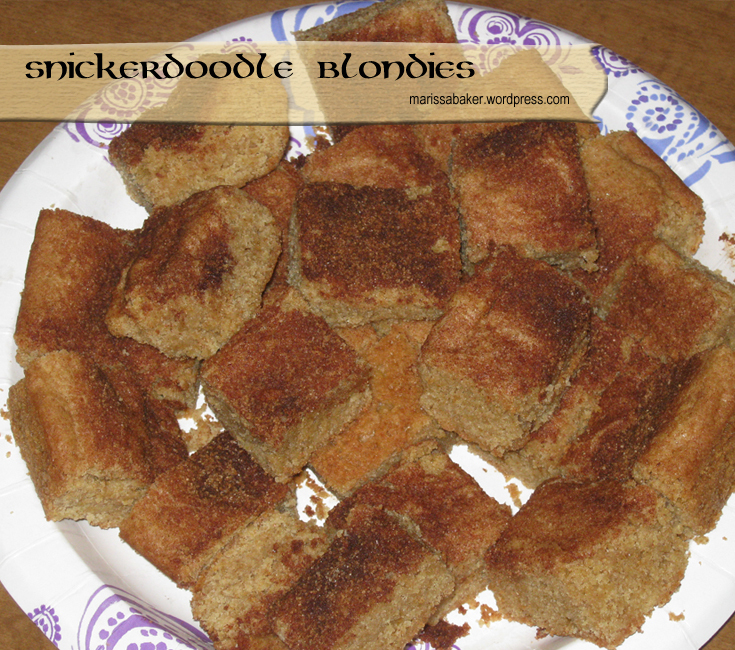 I tried a couple recipes for snickerdoodle bars or blondies before finding this one from Six Sisters Stuff. It’s so good! I still prefer the actual snickerdoodle cookies, but this is a very tasty bar form that takes much less time to make since the dough doesn’t need chilled and you bake the whole thing at once. 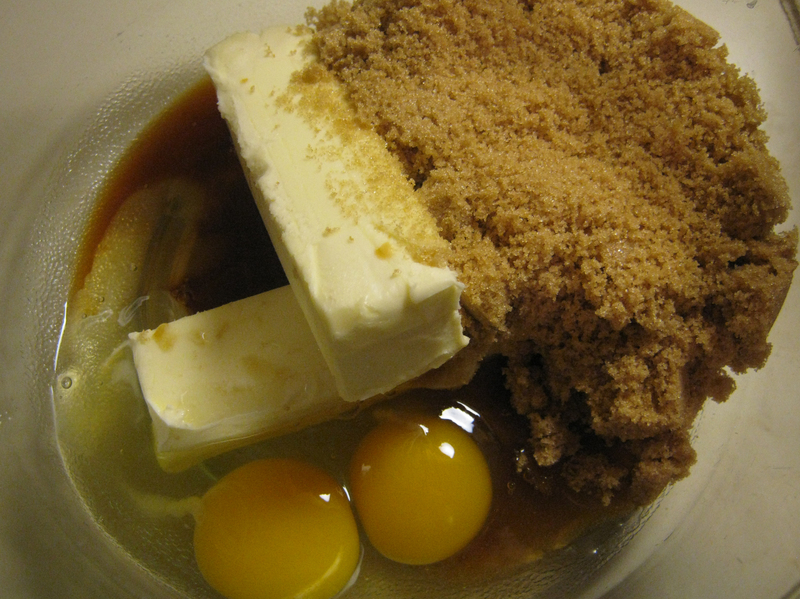 Combine the butter, brown sugar, eggs, and vanilla in a large bowl by hand or with an electric mixer. Stir in dry ingredients. 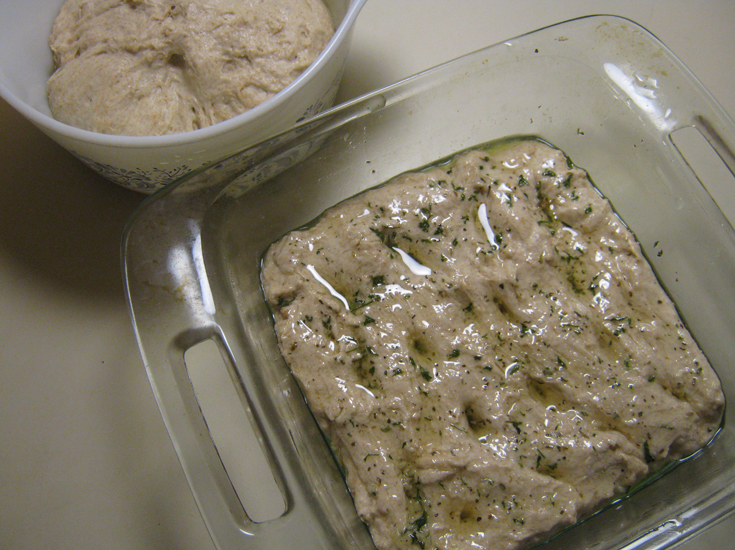 Spread batter in a greased 13×9-inch baking pan. In a small bowl, mix the cinnamon topping ingredients, then sprinkle over the top of the batter. Bake at 350°F for 25-30 minutes or until top springs back when pressed. It’s the Great Garden question — what do I do with all that zucchini taking over my garden? It seems to grow overnight. One moment it’s shorter than the length of my hand and the next moment it’s the size of a baseball bat. I usually stir-fry zucchini or turn it into bread (see recipe here), but I needed more options. 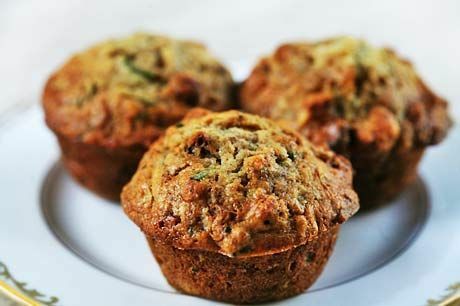 So I turned to the ever-trusty Google for answers and found several recipes to try. Verdict: This recipe is definitely a keeper! Roast Carrots and Zucchini “Fries” from Voracious Veggie. This is the very best way to cook carrots. They’re healthy and taste like candy. 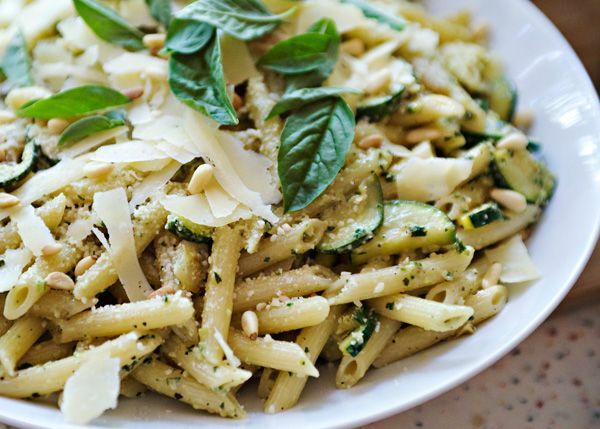 Since we like them so well, we thought we’d follow this blogger’s suggestion and cook zucchini the same way. Maybe I did something wrong, but they were gross. Soft, squishy, slimey — the texture was so bad I couldn’t even tell you if the taste was any good. 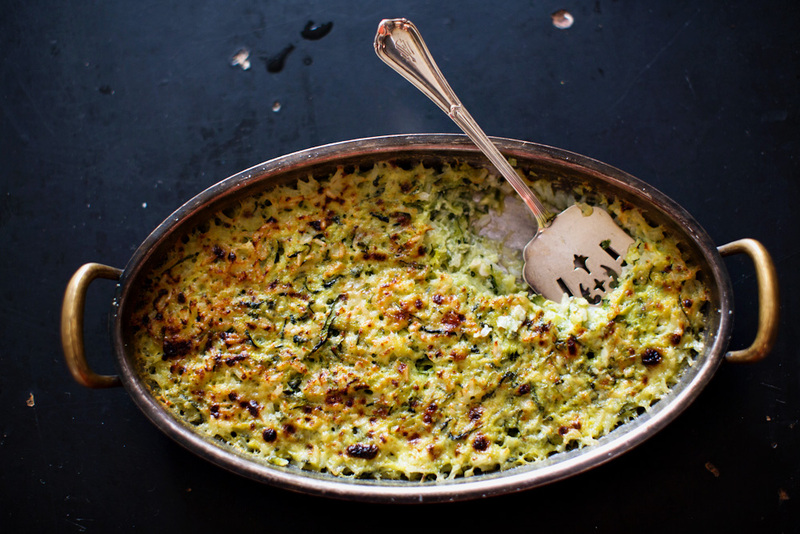 Zucchini Pistou from Baked Bree uses as it’s base a French version of pesto made with zucchini as well as basil. It caught my attention because Bree’s pictures are so gorgeous. Mine didn’t look much like this (for one thing I ran out of basil and used walnuts instead of pine nuts in the pistou), but it had a pretty good flavor. Verdict: I cooked too much pasta, which spread the sauce around too much, so I plan to try this one again and see if I can get it right. This recipe is one of the answers to the question, “What do you do with broccoli heads the size of bowling balls?” Seriously, that’s how big these things are. I’ve never seen broccoli grow this large. We weren’t able to use it all before they started to bloom, but the plants we cut are already producing side-shoot broccoli heads. If you’ve grown broccoli, you know the second heads are significantly smaller than the first ones. For these plants, that means they are size of broccoli you see in the grocery store. Heat oil in skillet over medium-high heat. Add chicken and cook until no longer pink. 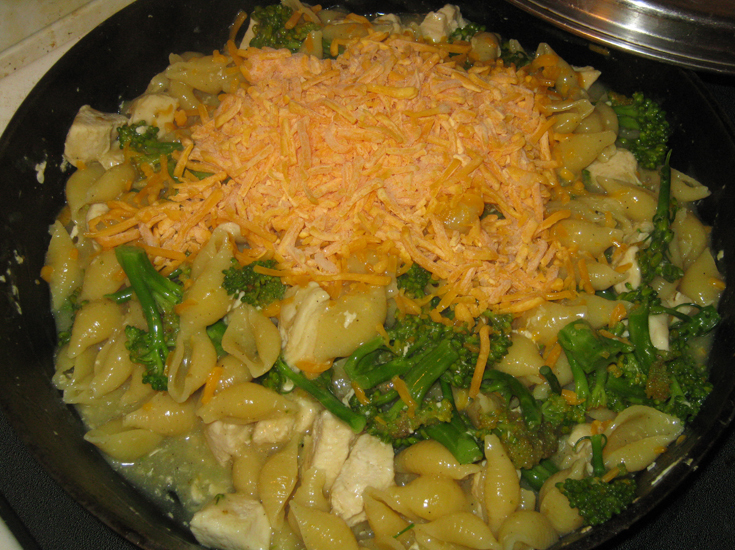 Add broccoli, broth, soup, pepper, garlic and pasta. Bring to a boil. 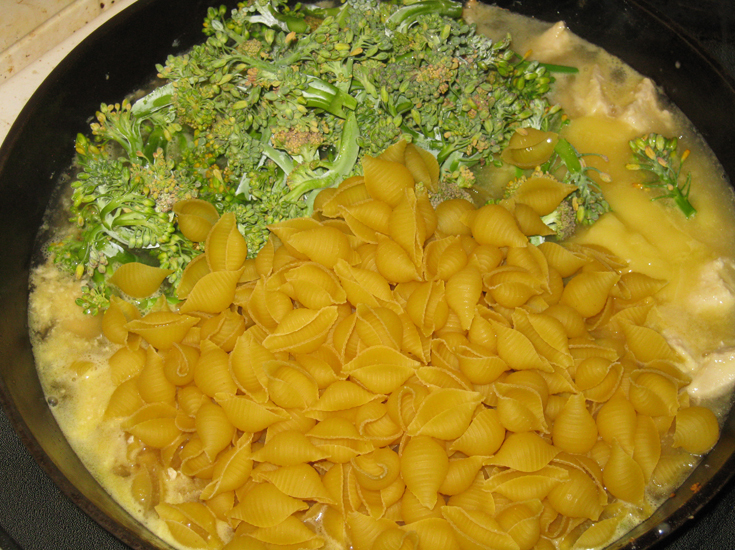 Reduce heat to lowest setting, cover, and simmer for 15-20 minutes, or until pasta is tender. Stir occasionally to prevent sticking. Check near the end of cooking and add a small amount of water, if needed. Stir in cheese during last two minutes of cooking.